What a crazy weekend of low clouds and variable airflow at Kahana. Lots of pilots flew both days despite the strange conditions, and a few of us even managed to fly cross country despite cloud bases as low as we've ever seen them. Apparently some kind of surface trough had snuck in behind the forecast for sunny trades. 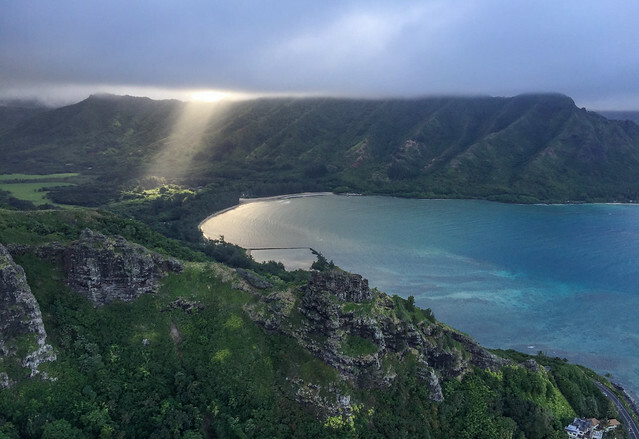 But nevertheless we managed a tentative bay crossing on Saturday and a full fledged trip to Kualoa on Sunday, connecting the misty ridge lines by surfing below, around and above the clouds. Great to fly with visitors Chris and Lindsay, Miami Eddie, Maui JJ, and AK Jason who is back with us for a few days.